If you think that we get a lot of apps that allow you to shoot photos and view them in a feed, you have no idea. We get dozens of these apps in for review a month and very few of them manage to stand out as different from apps like Instagram that already dominate the market. But Trover is something special. It’s not necessarily a place to share photos, although the images populating the app are almost universally high quality. Instead, it uses photos as an anchor to help people share art, food, monuments, places, restaurants, cool locations and just about any other type of interesting thing that you might discover. 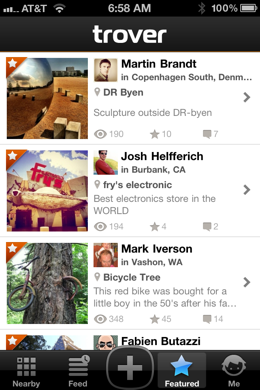 Almost immediately upon launching Trover [App Store, free] you see the brilliance of its design. You’re presented with a familiar looking grid of photos that mimics the appearance of other photo sharing apps. But then, as you scroll down, you’re presented with a ticker in the upper left corner that shows you traveling further away and you realize that these are images that are all around your current location. As you scroll down the list you’re effectively taking a walk through your neighborhood, outwards and away in all directions, discovering interesting things as you flick. The way that the Nearby section is set up means that you’re always going to be seeing things that are close to you and interesting enough for people to want to share. If you’re planning on traveling to another location, or simply want to explore another city, you can set your location to anywhere in the world and get the same treatment there. It’s an incredibly efficient and logical way to see cool things very easily. There’s also a feed section that shows you incoming shares from around the world as well as ones that have been commented on or favorited a bunch. But the real gem of Trover isn’t even the great layout and immediate engagement. It’s the way that it fosters a sense of purpose when you’re sharing. 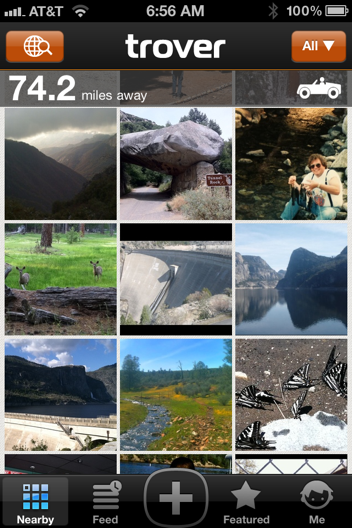 Trover has been on a limited test run with about 70,000 users for the past three months. This has given them time to get the app populated with shares. When you begin to browse them you get the sense that there is very little fluff here. You’ll find very few pictures of random cats or people’s faces pouting in Trover. Instead you’ll find beautiful scenic views with exact geolocations, shots of food plates with restaurant information and a quick opinion. 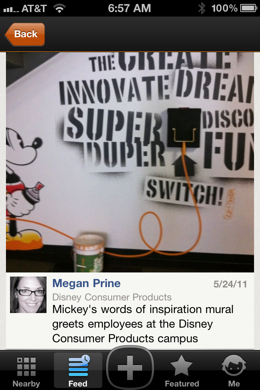 Almost every share that I’ve seen in Trover so far has been interesting and relevant. We’re talking in the 99th percentile of cool discoveries. I’ve already started finding things that I’ve never seen in my own town and it’s making me want to get up and get out to see what I can find. This feeling of walking through your neighborhoods and discovering new treasures is the exact way that the creators of Trover, including Expedia and Zillow co-founder Rich Barton, Andrew Coldham and Jason Karas, wanted users to feel as they used the app. I spoke to the guys about the app and they were clear that the feeling of “you should go here” that you get from every share was no accident. Trover was designed to get people traveling and exploring and to help those people share the things that they discover with others. 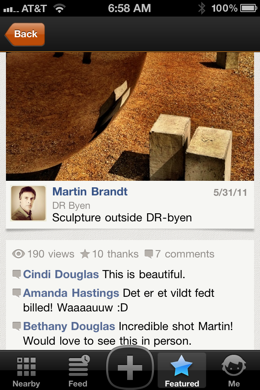 This isn’t just a photo sharing app, it’s a feeling sharing app. It’s an outlet for that feeling that you get when you don’t just want to share an image of something cool, you want others to be able to find it and enjoy it for themselves. 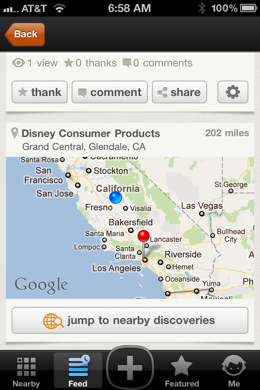 Trover is currently available for the iPhone but will have an Android counterpart app in the fall. The latest version, released today, adds login via Twitter and email as well as Facebook. They’ve also added a ‘read only’ browsing experience at Trover.com to go along with Instagram-like web views that you can share with friends on social networks. If you’re already a user of Instagram or any other photo sharing app then you’re already familiar with how to use this app. Once you’ve got it installed however, you’ll find that the way you share things and the reasons that you do are far different with Trover. If you’re interested in exploring the city around you, or any place that you travel to, I’d highly recommend checking Trover out. Its organic and purpose-driven feel means that your investment in time is paid off with solid returns in the form of great new discoveries.